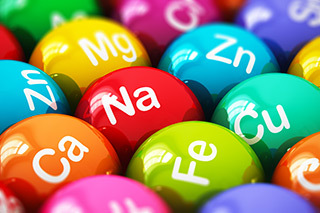 Minerals usually work together synergistically with vitamins in a multivitamin supplement, though they can also be consumed in a variety of food sources. Take, for instance, a raw banana. According to the USDA Nutrient Database, a raw banana contains seven minerals: calcium, iron, magnesium, phosphorus, potassium, sodium and zinc. Some minerals, like calcium, compose the very architecture of your body, making up many structural parts including your fingernails, your teeth and your skeleton and bones. Other minerals have the important job of helping to regulate your heartbeat, making hormones and triggering enzymatic reactions throughout the body. Despite their importance, the human body contains relatively small amounts of individual minerals. Collectively, only about 4% of a person’s weight is in the form of minerals. Nutrient data for 09040, Bananas, raw. USDA. National Nutrient Database for Standard Reference, Release 25. Retrieved from: http://ndb.nal.usda.gov/ndb/foods/show/2178?fg=&man=&lfacet=&format=&count=&max=25&offset=&sort=&qlookup=banana February 12, 2013.